The Kids and Kritters parade will be held on Saturday, February 23, 2019. Registration at 1 p.m., parade begins at 2 p.m.
All are welcome to join the youngest Mardi Gras revelers as they parade in their best Mardi Gras get-ups. Leading the parade will be the Krewe of Kids royal court, followed by their members. The Krewe of Kids is comprised of elementary school children. Decorate your stroller or wagon and join the parade; or parade on foot. No motorized vehicles, no pedal vehicles allowed. 2019 THEME – “Magical Mystical Mardi Gras”. Kids and Kritters is a walking procession within the Casino Beach parking lot. 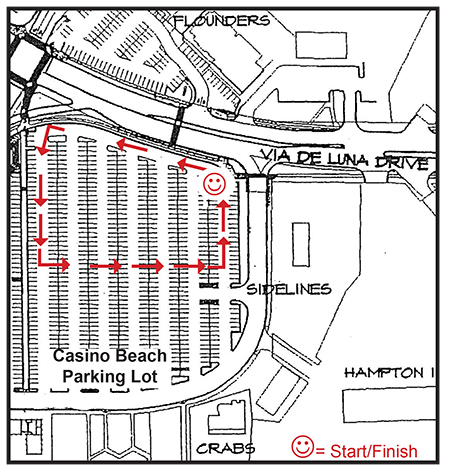 The route starts at the Northeast Corner of Casino Beach Parking Lot, across from Sidelines. Entry fee for kritters is $5. Kids are free. Make a MINI FLOAT from a wagon or stroller and join the fun. Costumed Kids and Pets welcome, both need to be well-behaved and supervised by their parents. No leash required for kids, but pets must be on short leash. Prize for best decorated “mini float” (decorated wagons and strollers) and for best costumed pets. Bring your well behaved pet, costumed, on a short leash or carrier to join the kids. This is the only event of its kind. Don’t miss it. Spectators are welcome to catch beads and trinkets as the Kids and Kritters march around the parking lot.